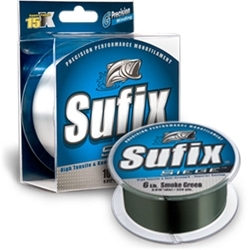 For Longer, More Accurate Casts and Unmatched Toughness, The Sufix Siege Line belongs on your reel. This line has superior casting distance with pinpoint accuracy due to its proprietary extrusion process and has up to 15X greater abrasion resistance. The Seige Series has exceptional knot strength and smooth handling with exclusive G2 Precision Winding that virtually eliminates line memory.